Arrive at Tan Son Nhat airport. Meet and tranfer to hotel. Dinner and overnight in Ho Chi Minh City. Cuchi Tunnel is nearly HochiminhIn the morning, you’ll visit the Cu Chi tunnels, a Byzantine maze of underground passages, chambers, rooms and booby traps used by both the Vietminh and the Viet Cong to suddenly materialise as if from nowhere, launch a lightning ambush, and vanish equally rapidly. You’ll return to Ho Chi Minh City to have lunch. In the afternoon, your car and driver will come to take you for your Ho Chi Minh City tour. You’ll visit the Museum of War Remnants which provides a very partial, but riveting, perspective of the ‘American War’. You’ll visit Centre Post Office with colonial building and the Cathedral Church. You’ll have approximately two hours to visit Ben Thanh market, one of the liveliest areas of Ho Chi Minh City, is packed with every conceivable commodity and a visit to lacquer workshop to see the complex processes and meticulous workmanship involved in this traditional Vietnamese craft product. If time permits, you’ll visit Thien Hau Temple and the China Town. You’ll spend the night in Ho Chi Minh City. chonoi in vinhlongDrive to Vinh Long, a city famous by the Mekong River and floating market. 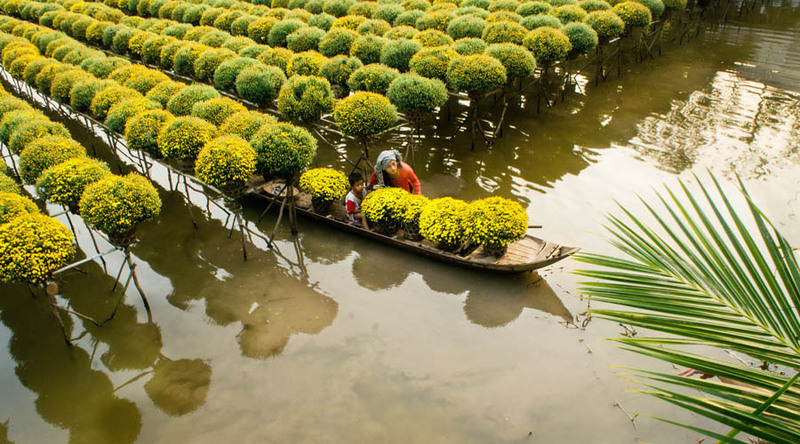 You’ll cruise to visit Cai Be floating market, fruit orchards, a traditional family-run brick kiln. You’ll have a lunch at one of the local family and have a shot show of traditional music in Mekong Delta which is operated by the local people. You’ll have time to wonder around the fruit market to buy some kind of famous tropical fruit such as banana, pomelo, dragon fruit, and mangos tin and so on. You’ll return to Ho Chi Minh City. You’ll spend the night in Ho Chi Minh City.